After the race not going as planned on Monday, I started second-guessing my training. I know that I have improved a LOT over the past few months, but the race set my confidence back a notch. Instead of doing the planned short intervals today, I decided to try and run three miles, each at a sub-8:00 pace, to prove to myself that I can do it (something I've only done once before). 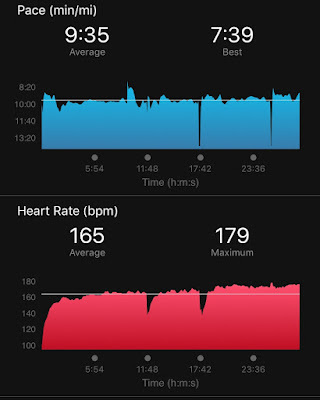 My plan for Monday was to hit sub-8:00's, but I fell apart after two miles--my heart rate was higher than I'd EVER seen it (over 200 bpm) and I just wasn't feeling good that day. While I really love the new training schedule I've been doing, there aren't any tempo runs, which has been on my mind the entire time. I really think tempos are crucial (for me, anyway) in doing well during a race. I've been reading a book by Matt Fitzgerald (author of 80/20 Running, the book I just read) called Run: The Mind-Body Method of Running by Feel. I realized that "running by feel" is what I was doing in 2013 when I was my fastest. I wasn't following a strict schedule, but I did have structure and I adjusted it as necessary based on how I was feeling. Today, my intuition was pushing me to do a short, fast run. I needed it for the confidence, if nothing else! So, I dressed in the same clothes I wore to the race Monday (I didn't want to do well and then think, "Maybe it was the clothes!" haha). It was a great morning for a run--not super windy, and 29 degrees. I hit the first mile on target, at 7:58. I wanted to stop so badly, but again, I knew my body was capable. I tried to shut of my mind, and just focus on the music and my surroundings. I noticed that when my heart rate gets over 175, I start to feel like it's *too* hard; so I tried to keep my heart rate under 175, but keep the pace under 8:00 as well. I started thinking, "Maybe I'll just run two miles at this pace--I can go for three next week..." but I kept reminding myself that it was only a head game. I focused on the mechanics of my body, just the rhythm of my legs moving over and over, and my arms pumping. Anything to get my mind off of how difficult it felt. Hit mile two at 7:54. The third mile was the hardest. I was so tempted to call it off, and I kept bargaining with myself to go just a little farther. I knew this run would either make or break my confidence, and like I said, I really need the confidence right now. My pace slowed to about 8:10-8:15 for the first 3/4 of that third mile, and I told myself it was okay. That's actually my tempo pace, so I knew that I would be doing my body good to run the last mile at that pace, even if it wasn't what I'd hoped. This run was my second fastest outdoor training run ever. The first was in March 2013, where I ran a 7:44/mile pace. Other than that run, TODAY is the only other time I've run three sub-8:00 miles in a row. Even at my 5K last month, my third mile was over 8:00. As you can see, I'm pretty damn happy that I was able to do this today! My heart rate was much better than on Monday's race, too. 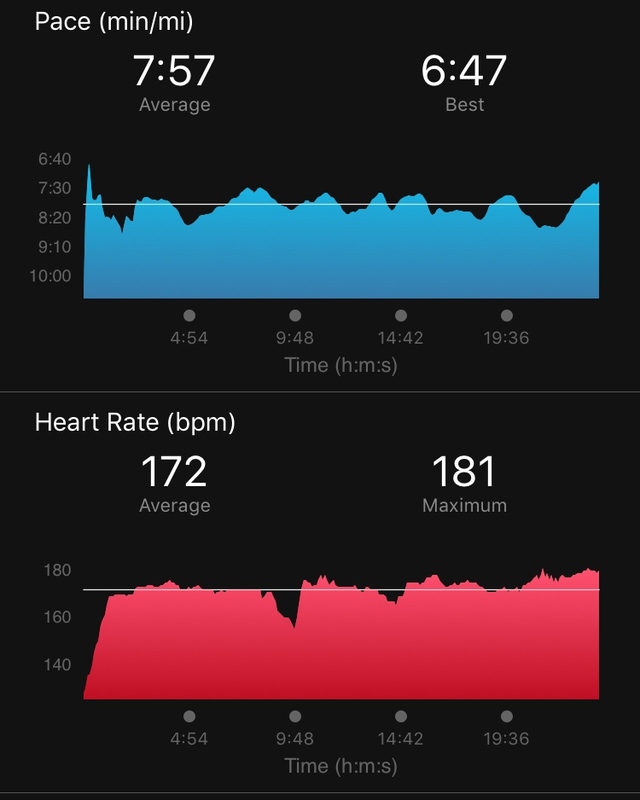 The dip in my heart rate today about nine minutes in is when I had to cut across an unpaved section, so it was snow/ice/grass and I had to slow down. 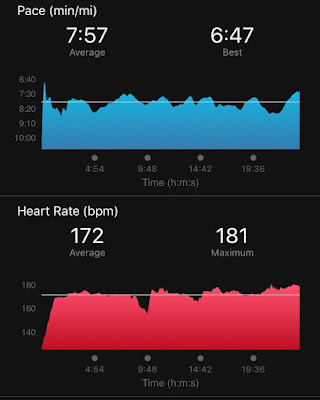 I'm not sure what caused the high heart rate on Monday, but it's nice to know that it was just a bad run that day, and my training is still on target. It's kind of interesting how much progress I've made in such a short amount of time. I spent most of 2015 with a stress fracture, and the only running I did was during run/walk intervals between the reoccurring fracture. My weight was at its highest in about five years in spring of 2015. My running pace had gotten slower than my FIRST year of running. I remember the 6.1-mile leg of the Toldeo Marathon that I ran, and I couldn't believe how hard it felt at an 11:27/mile pace. I wish I'd remembered to bring my heart rate monitor that day, because I bet my heart rate was sky-high as well. I finally had my breakthrough in August. I remember telling my friend Thomas that he could mark my words: I would get back to my goal weight and PR my 10K in 2016. I said it as a very bold, dramatic statement--not "I'm going to try" or "I'll do my best", but "I WILL get back to 133 pounds and run a 10K under 49:23 next year." Because I was so cocky about it, I thought I'd better actually do it. However, I knew that if I could pull it off, it would be a true miracle. Lose nearly 30 pounds and improve my 10K pace from 11:27 to 7:55 in about six months? Ha! But I started counting calories, and I quit running altogether for six weeks in order to heal my stress fracture. In October, I started gently running again--not much distance, and no speed work. The weight loss alone made my running much better than the 11:00+ miles I was doing before! But what interests me most is when I compare it to today's run. I ran the exact same route. My heart rate was a little higher today, because I was pushing myself hard, but my pace was 7:56 instead of 9:35. If you're a runner, then you know what a big deal this is to me. Great run today! I'm shooting to run the year (2016 miles in 2016) and so I have been running my miles at a pretty relaxed pace so that I can run every day. I need to take a hint from your post today and really push my pace. Thanks for the motivation. Amazing. You are so inspiring Katie! Way to go for aiming high and achieving it!! Awesome! You ran 3 miles in 28 minutes, I wish to be like you someday soon. 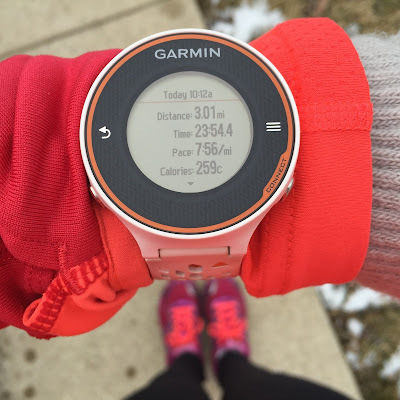 If I do not have a Garmin gadget like yours, how els can I measure my pace while running? So happy you got out there and did it. The race was just a bad day, you have improved so much! Great run! Wow, that's so great! You are so mentally (and physically) strong. Congratulations!!! You did it!!! Yay!! I really enjoyed this post and the play-by-play of your thought process. I'm really impressed that you were able to overdone the mental hurdles. Awesome job!! Yay! You pushed through that mental battle and kicked that run into high gear and proved to yourself how capable you really are!